The tooltip seems to be working correctly, but there is no info displayed right on the item icons, like in the addon example screenshot. Is there an update planned for this addon? Re: Update Coming for 4.0.1? Is there an update in the works for version 4.0.1? There most definitely is. I've been preoccupied with some other RL-things lately, but a WoW4 version is coming shortly. It doesn't matter if you win or lose. It matter if I win or lose. Hopefully, the new version 0.12 fixes your problem. Thank you for the fast reply. Aah, it's working now. I was just briefly testing the addon and wasn't moving anything. How come the tooltip is always up to date and the other text isn't? That is because some other addon is forcing an update of the tooltip. ItemAge just hooks in to the tooltip-update. That means it will update whenever something else updates it. With no other addons installed, it would then update every time it is displayed. Also today I noticed a different bug. 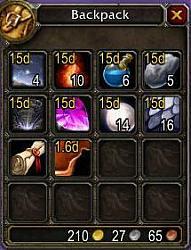 I have disabled all the icon text (bag, bank, and gbank) and just use the tooltip, but today I noticed it was gone. Tried typing /age tooltip to no avail. However enabeling bag icon text got it back, but now the age is at 1sec and counting again. Seem that if you disable all the icon text the database is deleted or is it just because I haven't played in a while? It's ok to remove entries that I have gotten rid of a while ago, but it's a shame if the database is deleted just because I take a break from the game. This definitely sounds like a bug. If you are using the last version, it should not delete in that manner. The only way I can think of that will do that is if you have had a break for more than 100 days with a quite a bit older version of ItemAge, and then start playing again and upgrade to the last version. That would delete all items older than 100 days due to a bug that was present earlier. 1. Item must have been located in your bags the last time it was seen. 2. If so, it will be checked for the time of its last appearance. Not how old it is, but how long since last time iot was seen. 3. If it was in your bags, and hasn't been seen for 100 days, then it is deleted. That means that any item you wear, have in your guild-bank or regular bank will not be deleted however old it is. Looking at some older items i my bags I see I might have been mistaken, they still have their age. It seems to me that new items are not added to the database if icon text is disabled, it will immediately be added however when it is enabled, but as new items. Items in unsupported slots like your equipped items will only get an age if icon text is on and they are moved to a supported slot like the bags. It will retain age info if moved back. Thank you for thorough testing. This is very good info, and it should be enough for me to find the bug. * Item's acquired/discovered while icon text is off are not added to the dbase. This also raises the question if the counter starts when the item first is added or when the bags are first opened after the item is acquired, not too important though. I will check into this. * Equipped items have no age if they are acquired before the addon was installed. True. I'm not so sure I will do anything about it, really. I'll give it some thought. * It would also be nice if the icon text was also up to date, but this won't matter as much as the item gets older and the age doesn't change so often. I don't think I will implement that. As of now, ItemAge is fairly easy to run for the computer, and the gain for such a feature would just not be worth it with regard to the impact on performance. But after all, only the first minute will be very visible. An hour later it is invisible. Last edited by sykopat : 04-16-10 at 06:52 AM. The item age in tooltip seems to work fine, but the timer displayed on the icon never updates unless relogging, reloading ui or toggeling display off and back on again. Using latest ver 0.10. Hmm. Strange. An update is triggered every time something changes in the bags, like new loot or something is moved. This also goes for your bank and guild-bank. If these events does not trigger an update, I would suspect another addon messing with it somehow. I am having the same issue as a few other people with the mailbox. When I open mail that has multiple attachments, ItemAge seems to block the propler tooltip from all the attachements, except for the first one. For example, I open a piece of mail that has 3 attachemnts, the first item is a piece of light leather, the next item is a sword, and the third item is a pair of leg armor. Before I take the item, if I mouseover the leather, it will show the proper tooltip for the leather. But when I mouseover the sword and/or the leg armor, the tooltip still will show the light leather info. I have found that as soon as I disable ItemAge, the proper tooltips display correctly, but when it is enabled, the displayed tooltip is always for that first item in that piece of mail. Which raises the question...might the bugfix be worse than the bug? . Fixes that affect in a negative way the main point of a mod (here: losing the recorded times for old items) severely reduces the usability of the mod. What is a typical scenario where v0.06's "Bugfix in database clean-up" would be of more benefit than losing old data? Been using v0.04 for months and have not seen much or anything related to a database cleanup bug. Ah yes. I see your point. The bug was that old items was never deleted. That means that every single item your character have ever seen pass through its bags (that would then include everything ever looted and so on) will never get deleted. Meaning the database will grow rapidly quite big when you consider that stacks of items are regarded as separate items. The fix was to reinstate the intended functionality where when an item is more than a certain age without being seen again, it will get deleted. This is only an issue when upgrading to the last version, and only happens to items in your bags (not bank/gbank). Since this bug now has been fixed (and hopefully nothing new turns up), items can be as old as they want. You will also see this on items that are more than 100 days that is in your bank or guild-bank. These will not be deleted and re-recorded. Easily checkable by checking if you have items older than that there. When I fixed the code, one of my characters deleted 745 items from its database. Sadly, some items in my bags got their time reset, but that is a one-time event. This will not happen every time some items gets too old. Only when the bug in the database is corrected, and the bugged items proves to be removable because of the "old" bug. Sorry about that. Actually, items older than 100 days (recorded with v0.04) will be reset. This is due to the bug that has been fixed. These items were reset and then re-recorded because of the error in the database. This should only apply to items in your bags and not in your bank or guildbank. Upgraded to 0.06. Similar to some earlier problems, its not interpreting the previous version's (0.04) saved variables properly. About half the items in backpacks show incorrect times ("22 s" and so on for items that had been there for days, as though the data for that item had been reset) while the other half show correct times. Last edited by ybe : 08-02-09 at 01:45 AM.